Feel stuck in a rut and sense that if you could get some kind of movement or progress it would feel amazing!? Live with any kind of pain, illness or ongoing suffering and long to be free of it? Often find yourself in a state of confusion and wish you had simple way to get clear? Constantly suffer from a sense of lack and wonder when your abundant self is going to show up? Experience conflict in your life, and are looking for a way to feel genuine peace without being a push-over? Like to 'work on your stuff' but would love a simpler and more time effective way to do that? Long to turn all that inner work you've done into practical, effective and rewarding outer work in the world? 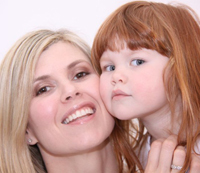 Sense there is a wholesome and easy way to stay connected to the realities of modern living, without compromising your commitment to a conscious lifestyle? Find you learn so much more when you can hear things several times, and work at your own pace? Join thousands of fellow NPA-ers in the playground of effortless transformation! 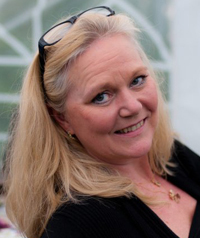 NPA has helped users release: depression, asthma, eczema, dyslexia & headaches plus stop smoking, lose weight, even end bankruptcy and a whole lot more! 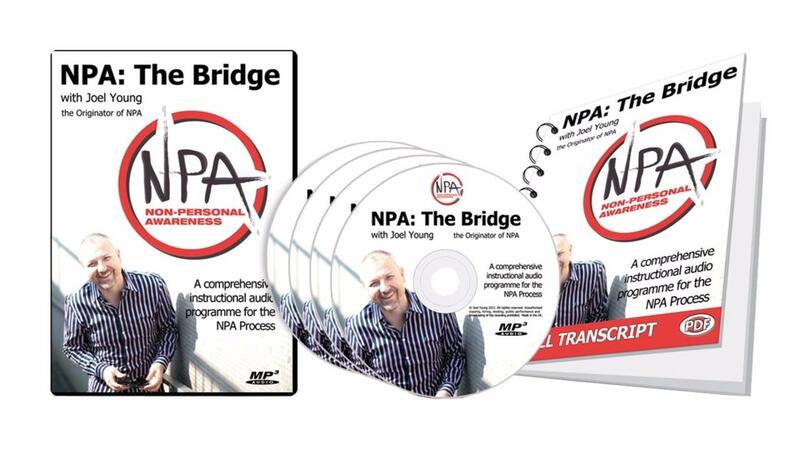 Here's an overview of the contents of "NPA: The Bridge"
A Complete Transcript: Get a beautifully presented transcript of the entire audio programme on PDF, including the appendices, to read through at your leisure, put on your reading tablet or print out! 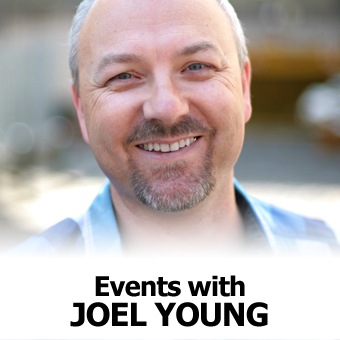 Joel Young is the Originator of NPA, a Visionary Leader in the field of Human Consciousness and a genuine 21st Century Heretic, with over 17 years experience of healing & teaching internationally. 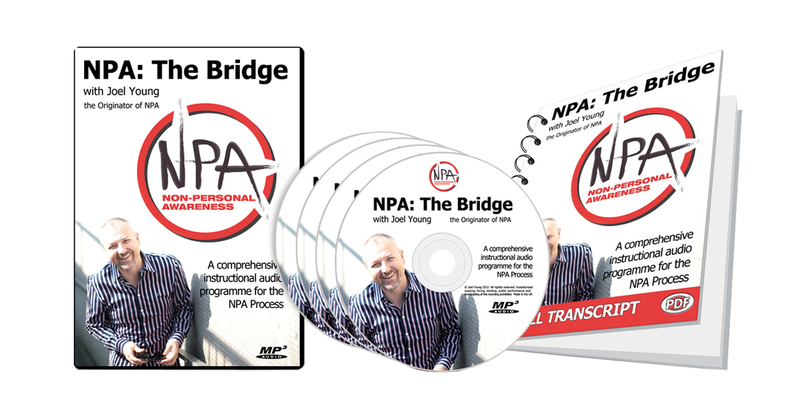 In his inspiring talks, seminars and online programmes, Joel shares the NPA Process and its message, asking you: "Are you ready for profound positive change that comes this easy?" Joel describes how in January 2006 he ‘disappeared’ in a cave in India, and in January 2007 he received a revelation in answer to a prayer. He was ‘given’ a simple process, and a message to share. The simplicity of the process belied its power and the profundity of the message is expanding through Consciousness, and the Global Community. Joel is renowned for his dynamic, humorous and clear delivery and has a knack for communicating the essence of a topic in a simple, heartfelt and easy to digest way. We have absolute confidence that this product will have a profound and positive impact on your your life. If you complete the programme and don't agree that you have, or will benefit from your experience and what you have learned, then we will give you your money back. Simple as that. Thank you for choosing to go ahead and purchase it! 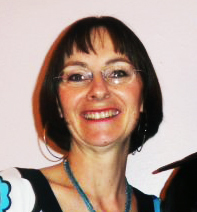 "Yes Please - I'd Love To Step Into The Wonderful World of NPA And Open To A More Easeful Life Experience!!"